We’re enjoying an abundance of Poblano peppers right now! In fact, I roasted two sheet pans full of them tonight. We love us some Poblanos. They’re generally a mild pepper, but every so often they pack some wonderful smoky heat! Roasting brings out their wonderful smoky flavor even more. They’re super easy to roast. Simply preheat the broiler, spread them out on a baking sheet then place them under the broiler. It will take about 10 to 15 minutes for them to blister and blacken. When they do, turn them over with tongs and let them go another 5 to 8 minutes. Once they’re blistered and blackened, cover and let them steam. This process is going to make those fine skins easier to remove; it helps to separate the skins from the rest of the pepper. The skin on Poblano peppers is very thin; if you can’t get all of it off, don’t worry about it. After roasting the peppers, cut them open along one side, remove the seeds and any other membrane. They are then ready to stuff! 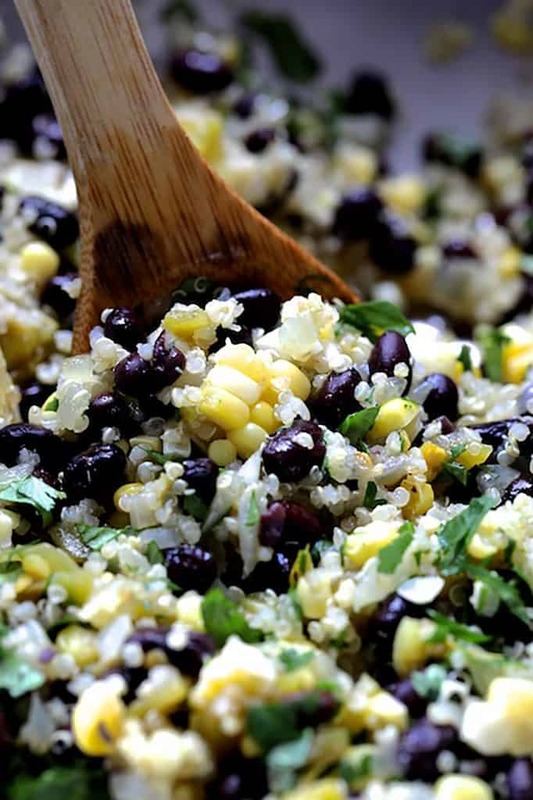 Cook up some quinoa, add fresh corn kernels and black beans. Some cheese…..
Now, I’ve made you work quite enough roasting the peppers, cooking the quinoa and the corn, so I’m not going to make you prepare the sauce. 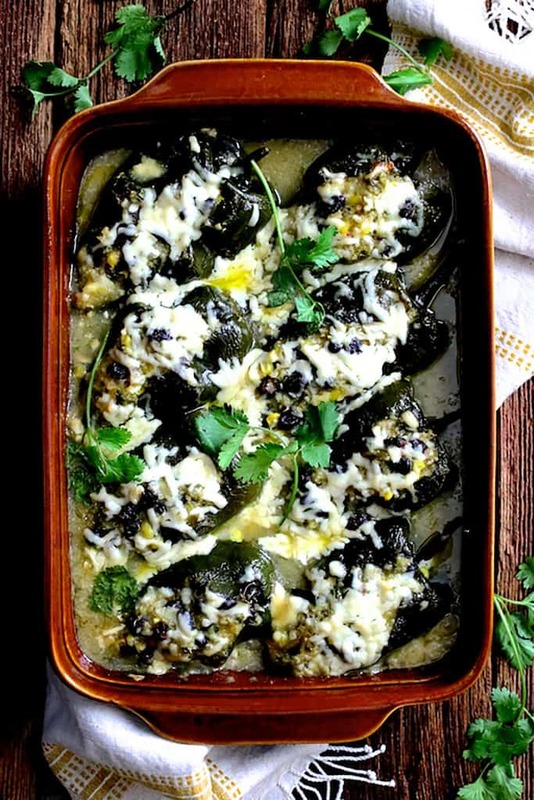 Simply pour a good-quality canned green enchilada sauce over the peppers, top with more cheese and you’re ready to bake these Quinoa Corn and Black Bean Stuffed Poblano Peppers! Mama. 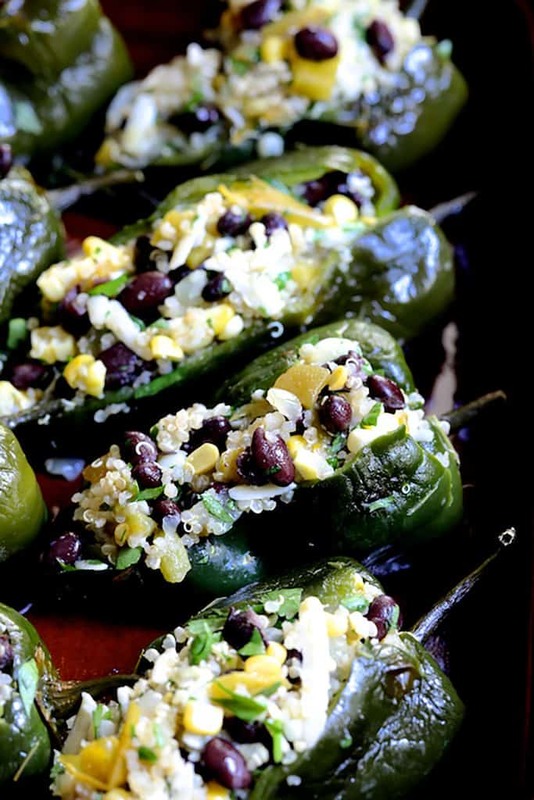 Quinoa Corn and Black Bean-Stuffed Poblano Peppers is a vegetarian dish that won’t make you miss the meat! This is also a great “make-ahead” dish that can be assembled and baked later. Who doesn’t love that? Now, let’s eat! And if you’d like another amazing stuffed Poblano recipe, check out my Chicken, Brown Rice and Cheese-Stuffed Poblanos! 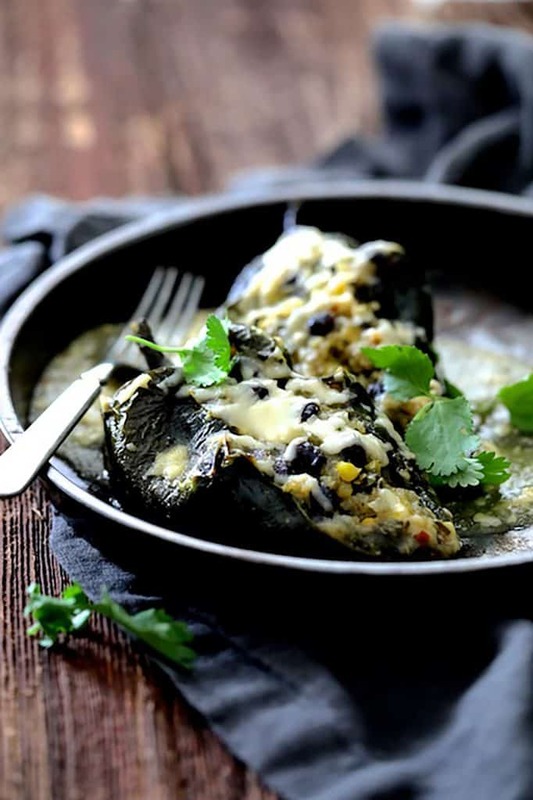 Quinoa Corn and Black Bean Stuffed Poblanos is the best kind of vegetarian comfort food! 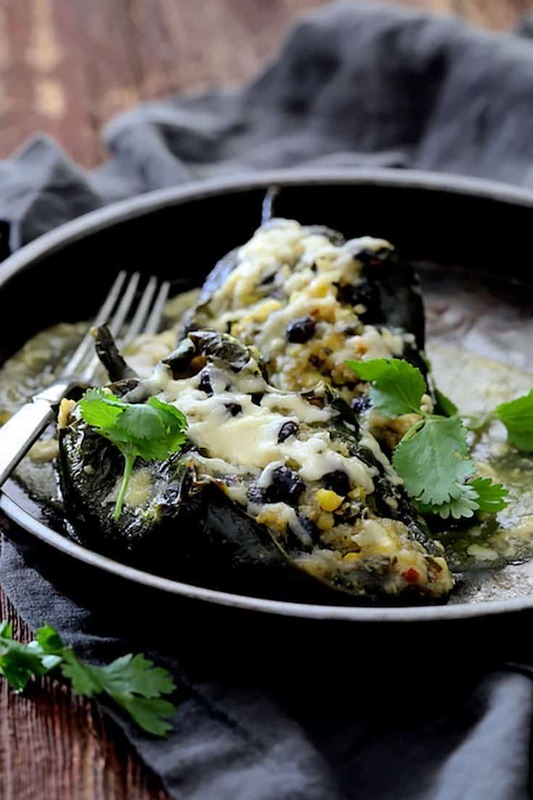 Protein-rich quinoa, corn, black beans, stuffed into smoky roasted peppers with a green chile sauce and plenty of CHEESE! Spray a 13 x 9-inch baking dish with cooking spray. Set aside. Preheat oven to 375 degrees. 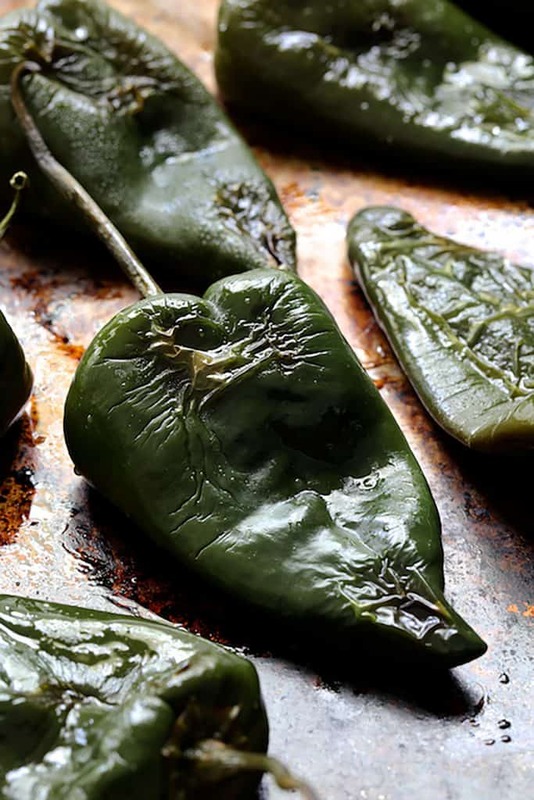 Place Poblanos on a baking sheet and drizzle with 1 tablespoon olive oil, rubbing it over the peppers. Roast for 20-25 minutes or just until lightly browned. (You don't want them overly soft or they'll be difficult to work with.) Let cool. Leave oven at 375 degrees. Meanwhile, bring a small pot of salted water to a boil. Cook the ear of corn for 2-3 minutes, then transfer to a ice bath to cool. Blot dry and shave off the kernels into a bowl. Set aside. Heat 2 tablespoons olive oil in a skillet or saute pan over medium-high heat. Add the onion and cook 7-8 minutes or until softened. Add the garlic and cook until fragrant. Let cool briefly then transfer to bowl with the corn. Add the quinoa, black beans, green chiles, cilantro and 1 cup of the cheese. Carefully cut open each pepper and remove the seeds and membrane, leaving the top intact. Fill each pepper with equal amounts of the filling and place in the prepared baking dish. Pour enchilada sauce over poblanos and top with remaining cheese. Cover with aluminum foil. Bake 30-35 minutes. Remove aluminum foil and continue to bake another 5-10 minutes or until cheese is melted and lightly browned. MAKE AHEAD: Prepare to the point of baking. Cover and refrigerate up to 24 hours. Hi, do you think these and/or your chicken version could be made ahead and frozen for baking at a later date? Thank you! Hi, Christina, Thanks for your question! Yes, both can be prepped ahead, frozen and baked later. You don’t want to roast the peppers until they’re too soft, however, because they’ll also soften up from being frozen. Thanks again and let me know how it worked out for you.